Who Have A Swimming Pool! You can trust the experts at San Diego Pool Guard to help you prepare for Foster Care Pool Fence requirements. The California State Laws and Policies for licensing or approving Foster and Adoptive homes, or Child-Care providers ensures a child’s inaccessibility to pools, including swimming pools (in-ground and above ground swimming pools), fixed-in-place wading pools, hot tubs, spas, fish ponds, and similar bodies of water with Foster Care Pool Fence. Serving all of the communities of San Diego, from El Cajon to Escondido. Our pool-safety-barrier-fencing and child-proof patented self-closing, self-latching and key-lockable gates meet California State Laws for pool-fencing required for child adoption, foster parent care, kinship care, and child-care providers. San Diego Pool Guard also meets stringent safety standards as recommended by the American Academy of Pediatrics. With San Diego Pool Guard’s quality materials, sturdy construction and professional installation, you get a convenient, cost-effective way to help protect small children from gaining access to your swimming pool and drowning. Spa cover next to automatic pool cover in Escondido. 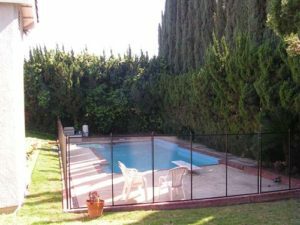 Pool-fencing-system (with child-proof-self-closing and lockable-gate) must completely surround the pool or spa isolating the area from any doors or windows, or garage that are accessible from the house within that enclosed area. A 5-foot self-closing gate (minimum height 60”) that latches and locks within 30-seconds is required for Foster Care Pool Fence. Basically, there will be required home inspections by local health departments, code enforcement officers, in addition to visits by a social worker to ensure that your home offers a pool-safe environment for a child, and that you meet state licensing standards for swimming-pool-barrier safety. The pool-safety experts at San Diego Pool Guard are here to help you get ready for this inspection. Here is a helpful tool from California Department of Social Services (CDSS) to help you prepare for inspection LIC 9217(3/05) – Pre-Licensing Readiness Guide – Family Child Care Home. Quality and durable Removable Mesh Pool-Safety Fencing Systems, and Swimming Pool Safety Nets and Covers (ASTM Certified-American Society for Testing and Materials). 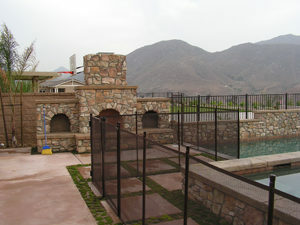 When a building permit is issued for construction of a new swimming pool or spa, or any building permit is issued for remodeling of an existing pool or spa, at a private, single-family home, it’s recommended that the pool shall incorporate removable mesh pool fencing that meets (ASTM) Specifications F 2286 standards in conjunction with a gate that is self-closing and self -latching and can accommodate a key lockable device. 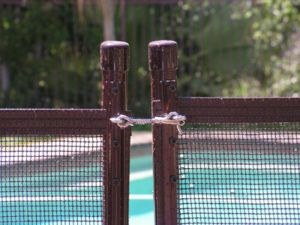 San Diego Pool Guard can install your Foster Care Pool Fence right away. The need for swimming pool safety awareness has reached new heights because child-drowning deaths have increased. What is heartbreaking is that it is preventable. As an adoptive parent, kinship-care provider, foster care parent, or child-care provider, your best solution to meeting California State Laws for safeguarding your swimming pool is San Diego Pool Guard’s Removable Mesh Child-Resistant Pool Fencing and Child-Proof Lockable-Gates. Along with the many benefits of backyard pools, spas and water features comes the ever present issue of swimming pool safety for children. With San Diego Pool Guard, you get peace of mind knowing that our ASTM Certified durable removable mesh pool fencing and child-proof lockable gates COMPLY with California State Laws and codes for home-care adoptive and foster parenting. Never put a price on peace of mind when it comes to protecting a child from falling in your pool. 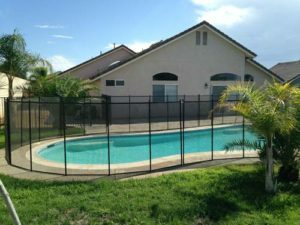 The actual cost of San Diego Pool Guard’s strong, durable ,and removable mesh pool fencing is very affordable making it the best child-protective investment you will ever make. The price of your safety pool removable mesh fencing generally averages around $1,400 (the cost of pool-safety-fencing is typically about $15-20 per linear foot, fully installed) with a wide range of options to choose from including a variety of colors. You’ll love that it’s the transparent swimming-pool-safety-barrier that doesn’t obstruct the view of your beautifully landscaped backyard. Protect your children and pets from the danger of swimming pool drowning.